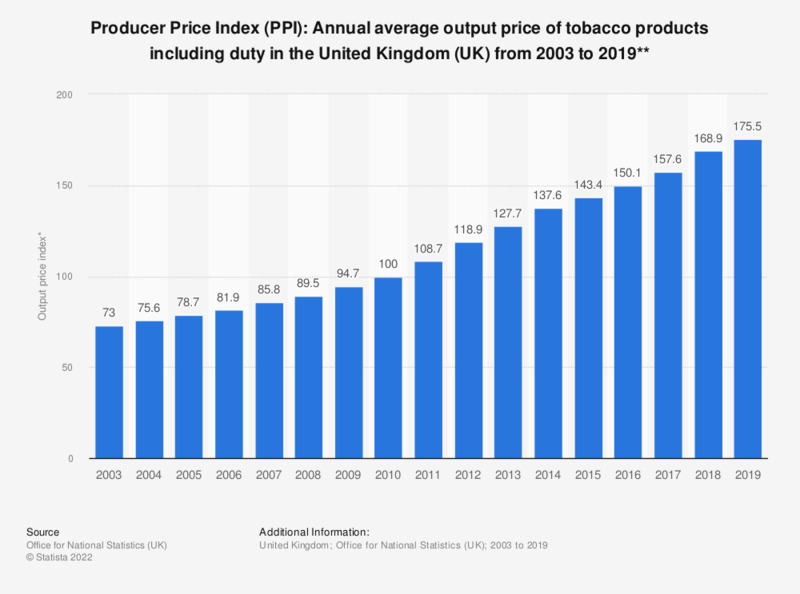 The statistic shows the annual average output Producer Price Index (PPI) of tobacco products including duty in the United Kingdom (UK) from 2003 to 2017, where 2010 equals 100. Over this period, the average output price index of tobacco products sold by manufacturers in the UK has increased annually, reaching a value of 157.6 in 2017. The Producer Price Index (PPI) measures the price change of goods bought and sold by manufacturers in the UK on a monthly basis. The output price indicies specifically measures the price of goods sold by manufacturers (also called 'factory gate prices') before any additional charges are added to give a profit. The price includes costs such as labor, raw materials, energy, interest on loans, site/building maintenance or rent.